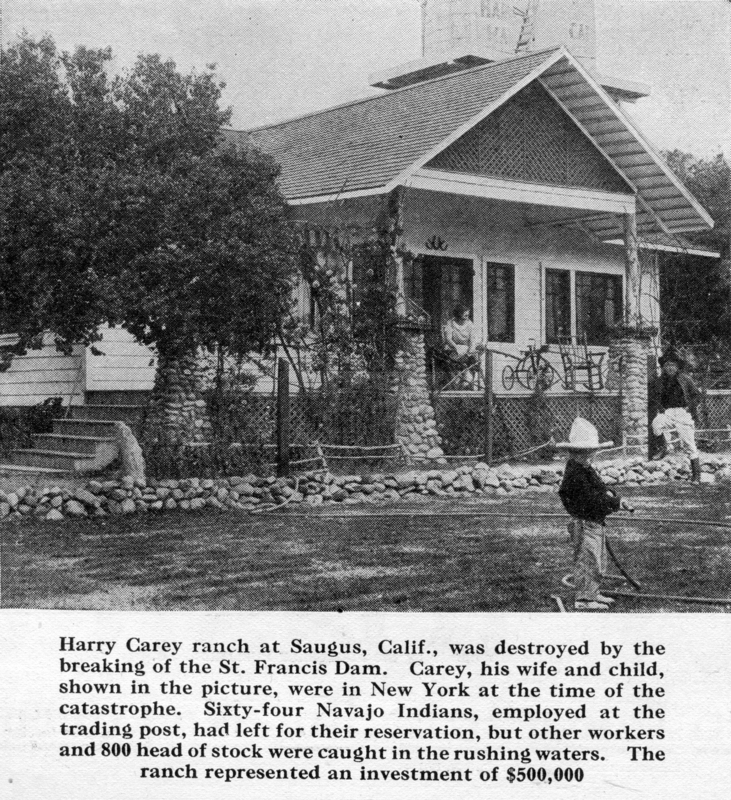 SCVHistory.com LW2271 | Harry Carey Ranch | Original Ranch House in Photoplay Magazine, 1928. Harry Carey ranch at Saugus, Calif., was destroyed by the breaking of the St. Francis Dam. Carey, his wife and child, shown in the picture, were in New York at the time of the catastrophe. Sixty-four Navajo Indians, employed at the trading post, had left for their reservation, but other workers and 800 head of stock were caught in the rushing waters. The ranch represented an investment of $500,000. Harry Carey (Sr.) is seen at right in the photograph. His wife, Olive, is on the porch. The child in the foreground is presumably Dobe Carey (Harry Carey Jr.), who was born in 1921. The twin water tanks are visible at top. The ironic thing about the inclusion of this particular photograph in the magazine is that this house wasn't lost in the flood. It sat on higher ground than some of other buidings, including the Trading Post, whose operators died in the disaster. This house survived another four and a half years. It burned down Sept. 2, 1932, when an employee who was carrying a lighted lantern walked into a shed to fetch some gasoline for a pump engine and the gas tank exploded. The flames spread to the house. Afterward, the Careys built a new home of adobe, which still stands on the property. Researcher Ann Stansell adds: The Trading Post operators were Clinton Harter and his wife Marian. Mr. Harter was also manager of the Carey Ranch. Solomon Bird, the Careys' cook, also lived at the trading post and was killed in the disaster. Bill Hart's new ranch home at Newhall, Calif., escaped in the big dam disaster, being on the very edge of the flood. His ranch home has been used as a center for relief work. Construction of Hart's home in Newhall had been completed just the previous year. The same edition of the magazine ran a story, "Making A Million," ostensibly written by actor Tom Mix, but it's penned in the voice of a hick, which Mix wasn't.